you, and what is your favorite flavor of ice cream? My name is Mary. I’m 10 and my favorite flavor of ice cream is chocolate. I chose Forest Born because of the cover art and because it's written by my favorite author, Shannon Hale. When Queen Isi used her wind power to stand up to Selia, Queen of Kel, and her guards. Rin, the main character’s problem was that she didn’t have a place - her home didn’t feel like home anymore. I would have done what she did. I would have worked up the nerve and gone out into the world and had my adventure and when I came back home it would feel like home again. I would tell her all the action is awesome. I love that it is so complex and there's amazing attention to detail. I also think the girl (Rin) on the cover is beautiful and seeing Rin on the cover reminds me what she looks like so I can imagine what she is doing in the book. Yes, and I have. I’ve read all the books in the series. This one was the last book, but I actually read this one first. 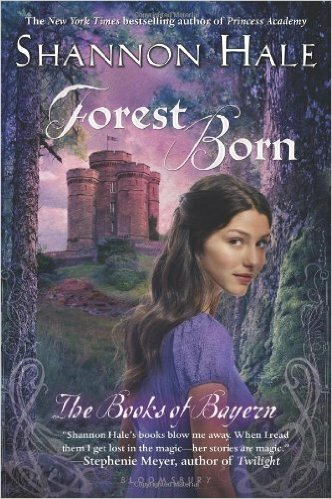 I read all the other books because of Forest Born. This book gives sort of a summary to all of them and I really wanted to get all the others so I could understand the inside jokes in the last one and experience the story even better than before. Yes, the other book in the series called The Goose Girl. It has a female character who has a semi-happy childhood and has someone to really look up to which is her aunt. The main character in The Goose Girl (Ani) lost her aunt. Rin looked up to her brother. Both girls also triumph at the end of their stories and get rid of the antagonist. 10. If you could ask the author one question about this book, what would it be? I would ask why Rin’s Tree-Speaking didn’t have more powers to it instead of dodging arrows and being half in the green world and half in the real world. Another power Rin has is the ability to feel the calmness of a tree and being able to transfer it. I want more powers though like perhaps Rin being able to grow a tree from nowhere or being able to make a tree come to life to defend her. How did you decide this? Hi Mary! I think that’s a wonderful question. Once I’ve written a book, as an author I try to get out of the way and let the readers answer those sorts of questions for themselves. Sounds like you’re thinking like an author. Have you thought about writing your own stories? Thanks to both Mary and Shannon for sharing a little about Forest Born with The Kidliterati! The Forest Born by Shannon Hale. Rin has always been a quiet, helpful girl, but a secret has been eating away at her, and the solace Rin once could find among the tall trees surrounding her forest home has vanished. When she leaves home to join her older brother in the city, she finds intriguing answers to her questions, an adventure she doesn't expect, and a sense of self she never thought she would find.